A. James Clark School of Engineering Dean Darryll Pines has announced that Professor Reza Ghodssi will become the new director of the Institute for Systems Research (ISR), effective October 1, 2009, for a five-year renewable term. 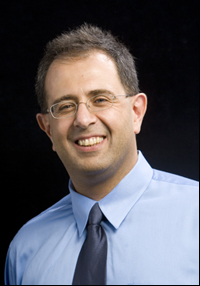 Dr. Ghodssi is the Herbert Rabin Distinguished Professor and holds a joint appointment in the Department of Electrical and Computer Engineering and ISR. At the Clark School he also is affiliated with the Fischell Department of Bioengineering and the Materials Science and Engineering Department; his university affiliations include the University of Maryland Energy Research Center and the Maryland NanoCenter. Dr. Ghodssi is the director of the Microelectromechanical Systems (MEMS) Sensors and Actuators Lab. Dr. Ghodssi's research interests are in the design and development of microfabrication technologies and their applications to micro/nano devices and systems, for chemical and biological sensing, small-scale energy conversion and harvesting. Dr. Ghodssi has over 70 scholarly publications, is the co-editor of the Handbook of MEMS Materials and Processes to be published in 2009, and is an associate editor for the Journal of Microelectromechanical Systems and Biomedical Microdevices. He has served as a program co-chairman for the 2001 International Semiconductor Device Research Symposium and as a chairman of the "MEMS and NEMS Technical Group" at the American Vacuum Society from 2002 to 2004. Dr. Ghodssi is chair of the 9th International Workshop on Micro and Nanotechnology for Power Generation and Energy Conversion Applications, also known as "PowerMEMS 2009." Dr. Ghodssi received the 2001 University of Maryland George Corcoran Award, the 2002 National Science Foundation CAREER Award, and the 2003 University of Maryland Outstanding Systems Engineering Faculty Award. He was among 100 of the nation's outstanding engineers invited to attend the National Academy of Engineering U.S. Frontiers of Engineering Symposium in 2007. Dr. Ghodssi is the co-founder of MEMS Alliance in the greater Washington area and a member of numerous technical and professional societies. In 1990, 1992 and 1996 respectively, Dr. Ghodssi received his B.S., M.S., and Ph.D. degrees in electrical engineering from the University of Wisconsin at Madison. He was a postdoctoral associate and a research scientist in the Microsystems Technology Laboratories and the Gas Turbine Laboratory at the Massachusetts Institute of Technology from 1997 until 1999. ISR is a vital and highly productive unit of the Clark School and the University of Maryland. It was established by a National Science Foundation grant in 1985 as one of six original NSF Engineering Research Centers, and is now a regularly budgeted research institute of the university. ISR works closely with industry to deliver one of the foremost cross-disciplinary research and education programs in the nation. ISR involves five University of Maryland colleges, and brings together 38 joint appointment faculty members, 29 affiliate and research faculty members, and 170 graduate students. They engage in research on systems engineering methodologies, intelligent control, intelligent signal processing, network security, hybrid communication networks, manufacturing systems, supply chain management, transportation systems, MEMS sensor/actuator design, nanotechnology, and neuroscience and neuromorphic engineering, through more than 20 constituent/affiliated laboratories. ISR has active programs in cross-disciplinary education and university/industrial partnership development, and offers an M.S. program in Systems Engineering.